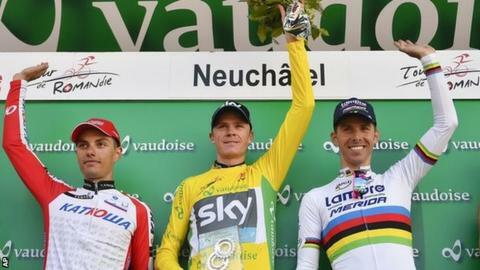 Britain's Chris Froome says he is building towards his Tour de France defence after winning the Tour de Romandie for the second straight year. The Kenya-born Team Sky rider dominated the 18.5km time-trial around Neuchatel to seal overall victory by 28 seconds from Katusha's Simon Spilak. "I am so happy to be back in the yellow jersey again," the 28-year-old said. "What a day for British cycling: four wins, shared between three very different riders, in the two best races taking place this week - one week before 2014's first Grand Tour starts in Belfast. "These may be warm-up acts for the headline events still to come this summer, but Chris Froome's time trial and overall double in Switzerland neatly answers any doubts about his form and fitness ahead of the Tour de France. "So too does Mark Cavendish's fourth win in eight days in Turkey. But it is the overall victory in that race for the 21-year-old Adam Yates that provides the greatest cause for celebration. The Bury-born rider and his twin brother Simon are perhaps now the best (but by no means the only) answer to the question: who's next in the GB production line?" On a bumper day for British cycling, Adam Yates and Mark Cavendish also triumphed in the Tour of Turkey. Yates, 21, who is in his first season as a professional, finished safely in the peloton to take the overall title, while Cavendish won the sprint finish in Istanbul to claim his fourth stage win of the eight-stage race. In Switzerland, Froome had led world time-trial champion Tony Martin (Omega Pharma-Quick Step) by a second at the top of the course's solitary climb and held on to win the stage by the same margin. He had started the day a second behind Spilak, but secured a considerable lead over the Slovenian on the short, final stage. It was Team Sky's third successive win in Romandie - after Sir Bradley Wiggins in 2012 and Froome last year - and the race is considered a good form indicator for the Tour de France, which starts this year in Yorkshire on 5 July. "It was a really good test for me," added Froome, who was making a competitive return after injury and illness. "It wasn't an easy race, it was flat out. But I am very happy to have the result. Now I am just building toward the Tour de France. "I wouldn't go so far as to say whoever wins the Tour de Romandie will win the Tour de France, but it's definitely a good sign - and a sign that I'm on track. "This has been a really hard period recently. I've had a chest infection and a back problem. I have had to work really hard to get back to this condition." 2. Tony Martin (Ger/Omega) +1"
3. Jesse Sergent (NZd/Trek) +8"
4. Rigoberto Uran (Col/Omega) +15"
5. Jon Izagirre (Esp/Movistar) +20"
2. Simon Spilak (Slo/Katusha) +28"
3. Rui Costa (Por/Lampre) +1'32"
4. Mathias Frank (Sui/ IAM) +1'44"
5. Vincenzo Nibali (Ita/Astana) +1'48"